Every day, there's a reason to celebrate. Time flies when you're having fun. From the scale of 1-10, how excited are you to return to your normal schedules after the holidays? -5? You're not alone. Almost everyone dread the first day back from the season that's merry and bright. Here's how to survive them post holiday blues. If you partied hard, you might still be feeling hungover. Drink plenty of water or better yet, have some sports drink. Alcohol leaves you dehydrated so you need to regain all the fluids you lost. Sports drink will make you feel less lethargic too. Exercise, dance, run, go to the gym. Do whatever floats your boat as long as you get those adrenaline pumping up again. It will also release happy hormones that of course will take the blues away. Now is also a good time to shed off those pounds you gained from the parties you went to, don't you think? Just because the most wonderful time of the year is over doesn't mean you have to stop being kind and gracious to others. Doing good will make you feel good. You're not the only one who enjoyed the holidays. Have fun swapping stories with your friends. It will make you focus on the essence of the holidays and the memories rather than feel dreary being back in the "ordinary". It's a matter of perspective. If you think happiness and enjoyment can only be found in the holidays, then you'll be blue for the rest of the year. Change how you see things. You can be happy in any day. You can make legendary happen in the mundane. Exceptional things can come out from the ordinary. Every day, there's a reason to celebrate. 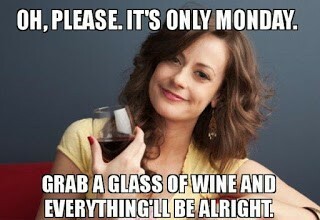 So how did you prepare for this most loathed, most dreaded Monday of the year? love your new avatar pics, dear! Happy New Year! Thanks for the list! Fun pics. I'm so glad to be back on my normal schedule so I can rest :). Lux, I'm really enjoying the first day after the holidays, getting back into the routine and having more time to think and write, visit with my online friends. But some good advice! Dearest Lux, excellent tips here, thank you so much for sharing them! Holidays are very enjoyable but I always look forward to get into routine. There are so many things to do around the house. Itching to get back to the computer. Lol! Okay, I just got my glass of wine and pretty soon everything will be fine again. Just kidding, I'm retired so Mondays don't bother me one bit. I am one of those disgustingly happy people so I seldom have "the blues". A smile and a laugh are my best tools. I totally like your tips, I think they'd work great for everybody. Thanks for sharing. I'm thinking maybe it's about not having a job you like. I used to feel that way...now that I have a job I enjoy, I actually don't mind coming back to work. It does take a little while to get back into the routine of things, though. Most of my clients are being pretty quiet today, though, so I've been able to ease back in. Is it the most dreaded Monday of the year? I was kinda looking forward to the fresh start. I made sure to fit sleep and relaxation, and chocolate, into my schedule. Happy 2016, Lux! A quite holiday at home but these are great tips how to survive. Such a lovely post! The only thing that excites me post the holidays is keeping up my resolution! I love love love your pics that go with your words. You are making a dent in the world Lux. A very happy new year from my heart to yours. Thank you for the useful tips. Have a wonderful Wednesday! Thanks for giving us some practical hands-on tools, friend! And let's get rid of all those left-over cookies! Yes, my first day of school was yesterday and it wasn't so good. I think I just need to work on the last one there and change that mindset of mine! This is one of the longest weeks I've ever had, haha! I will take your advises into account, hope they will help, but I am pretty sure everything will get back to normal soon! :) Happy New Year! Dear Lux, First of all I want to congratulate you on your new profile pic. It is wonderful! Your suggestions about life and love are rewards to those who have found your blog. It's a pleasure to be following you and I wish you the best in 2016. 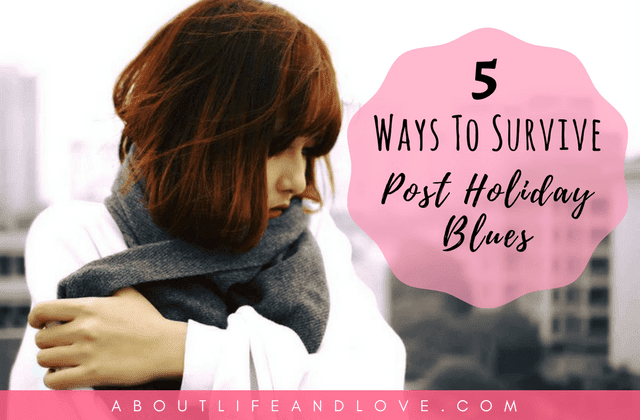 "If you think happiness and enjoyment can only be found in the holidays, then you'll be blue for the rest of the year"
Thanks for this timely post, Lux! Love your ideas. Wishing you many blessings in this New Year. I'm blessed to know you!! When I look at your list I realize that I'm in pretty good shape. I gave up drinking alcohol 23 years ago and every day without a hangover is a blessing, including New Year's Day. I hydrate throughout the day by drinking filtered water with a wedge of lemon. I exercise seven days a week. I try to stay in the holiday spirit all year long and enjoy committing random acts of kindness. Happy New Year, dear friend Lux! Ah... yes. The CRASH. One of the hardest things is taking down the decorations. My house always looks so empty afterward. Depressing. Back to the routines and stale smell of January. Thank you for these great ideas, Lux! How interesting. I didn't loathe it at all. I must admit it was not the best day, but God is good every day. I hope your week went well and you enjoy your weekend. Thanks so much for visiting me this week! This is awesome. Thanks for sharing ways to get back into the swing of things!